Well, the same language applies for the current coastal flood alert, which ends on Thanksgiving day, at 3 p.m. (just in time for hors d'oeuvres) and colloquially refers to King Tides—the big waves that hit the California coast several times each year due to a boost in gravity from the celestial arrangement. The Weather Service is cautioning that flooding may occur in "low-lying areas along our coast line and bay fronts during periods of high tide. Locations that are typically dry during high tide may become submerged due to this extreme tidal cycle." On Tuesday morning, it was pouring in Marin County. A row of cars on one residential street was half-submerged in salt water from the bay nearby. 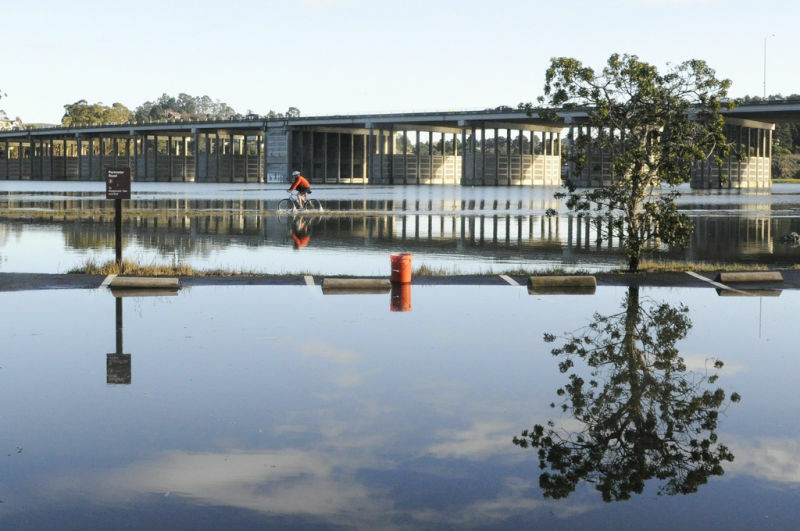 Hannah Lee, a Marin County Flood Control District engineer, told KQED's Sara Hossaini that she and her colleague/navigator, Beb Skye, can't afford to stay off the roads, since high tides like these are a flood planner's goldmine. Wearing heavy yellow rain slickers, the women checked on levees. "It's complicated," Lee said, "because a lot of the places we want to see are flooded from the tides, so we gotta find a way to get there without getting stuck." Lee was looking for low spots, where high waters could spill over into sinking nearby neighborhoods, many of which were built on former wetlands. "It just kind of pinches down right here, right next to the bridge," she said. "If the water level was getting really high in the creek, I would want to come here and see is it spilling out." Marin County advises the public to stay off the roads during King Tides. The California King Tides Project tells people to use extreme caution when getting close to the water. Take extra precautions when you walk on slippery areas or near big waves, and always be aware of your surroundings and the weather conditions. Also notice that shore birds may be taking refuge in areas above the tide line. Take care to not flush them out in the process of getting your shot. However, the organization also promotes the big tides as a forewarning of what a rise in sea level due to climate change will look like, and it offers this page of locations around the state where photographers can capture the inundations. Even better -- the map above, or here. Click on each location to see when high tides occur. Here's the commission's policy guidance in government planning for sea level rise. Looks like the Bay Area may have to make use of it… .